The Master Scuba Diver rating places you in an elite group of respected recreational divers who have earned this rating through both significant experience and scuba training. Fewer than two percent of divers ever achieve this rating. When you flash your Master Scuba Diver card, people know that you’ve spent time underwater in a variety of environments and had your share of dive adventures. The path starts with earning a PADI Open Water Diver certification, followed by PADI Advanced Open Water Diver and PADI Rescue Diver (or qualifying certifications). 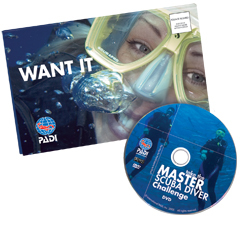 You also need to earn five PADI Specialty Diver certifications and have logged a minimum of 50 dives. Work with me to progress through these ratings and/or show proof of completion and earn your Master Scuba Diver certification today.